My favorite days on any cruise are the ones at sea and so far on the EPIC those days have been great. It is when the ship has to shine. Everyone is on board and every passenger has to be kept happy. On the Norwegian EPIC that task is overseen by Nelson Martins, the Hotel Director, and I had the pleasure of sitting down for a chat with him. He is the person responsible for about 1500 of the 1700 crew members. The other 200 work for the deck and engineering sections. Though he is not directly responsible for them he has to coordinate with them all the time. Nelson is a charming man who clearly enjoys people. It is great watching how easily he interacts with passengers and his crew. I learned he was born in Portugal and grew up in the south of France where his parents still live. He now resides in London where he first moved to improve his English. He went to school for a hospitality degree and learned everything from cooking, to food and beverage management to hotel management. He has his Master’s degree in tourism. After school he worked in the elegant Connaught Hotel in London. He began working at sea in the 90s and has an over twenty-seven year career at sea. His first ship was one of the Big Red Boats, a company no longer in existence. He was quick to point out that wasn’t his fault. Over the years he has worked for companies including Cunard and Disney. His first assignment with NCL was from 2001 to 2004. He was a restaurant manager just at the time NCL was beginning freestyle dining. Then he took some time to go back to school working in hotels and on other ships. To date he has a total of ten years as a Hotel Director and came back to NCL as the Hotel Director on the Norwegian JADE before joining EPIC in 2015. He talked about how long it takes for a hotel director to build a staff and to get to work with them seamlessly which he feels he has done on the EPIC. He has personally worked in every area of the ship he supervises and when he gave me a back of the house tour you could easily see how intimately he knew every area. The hotel director is responsible for the business side of the ship and that involves many millions of dollars for each cruise. On this transatlantic cruise each of the 2,114 cabins on the EPIC is occupied and there are 3,920 passengers. The EPIC can accommodate up to 5,000 which they do when more of the cabins are occupied by two or more people which often happens during the summer on Caribbean cruises where whole families come on board. This cruise many cabins like mine are occupied by only one person. 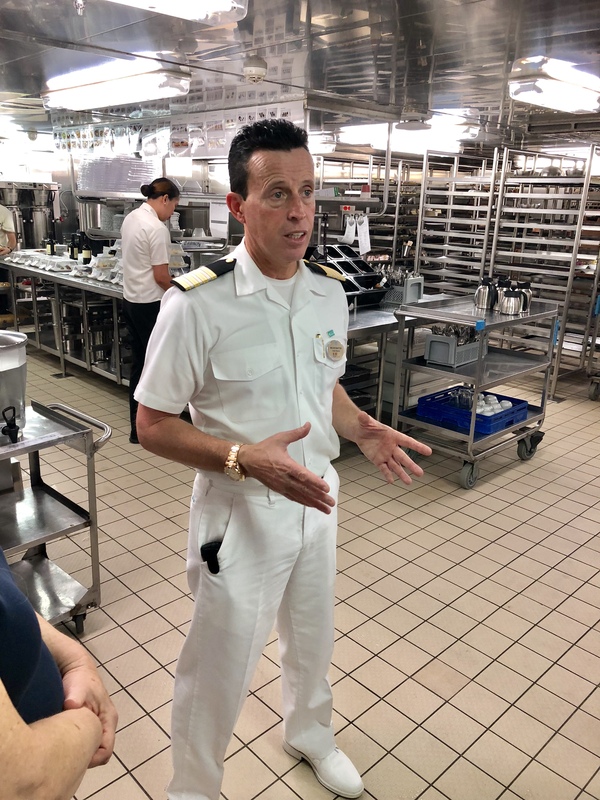 We spoke about how he works closely with Marco Quartesan, the captain of the ship, who I hope to get the chance to chat with before the end of the cruise. For me days at sea involve having coffee and juice delivered to the cabin each morning, then writing for a few hours, going to the gym which is large and well-staffed on the EPIC, then on to lunch and sitting in the sun for the afternoon. Really being lazy. Yesterday was not such a lazy day for Nelson. The weather changed quickly around noon when and it started to rain. For him that meant closing the outdoor restaurant and making sure staff was reassigned to the Garden Café and other indoor outlets. That appeared to be done seamlessly and when I walked into the Garden Café at about 2:00pm who did I see there walking around and conversing with his senior staff but Nelson. Every passenger I saw had a smile on their face despite a little rain. The sun came out again by 3:00pm and I headed to the Posh sun deck. The crew was quickly bringing out the chaise lounge mattresses again and restocking the towel bins. The outside bar was getting busy again very quickly. Clearly everything was going well due to the hard working crew overseen by a very competent hotel director. Now it’s one more sea day before we make a stop in Philipsburg, St. Maarten.